One way we can remember Bibi Fatemah Zahra (SA) every single day is by reciting the Tasbih of Bibi Fatemah Zahra (SA) after every prayers. It is said that the daily prayers are like flowers, and the recitation of this Tasbih is what gives these flowers a beautiful smell. This Tasbih is known as the Tasbih of Bibi Fatemah Zahra (SA) because it was given to her as a gift from her father, Prophet Mohammed (SAW). 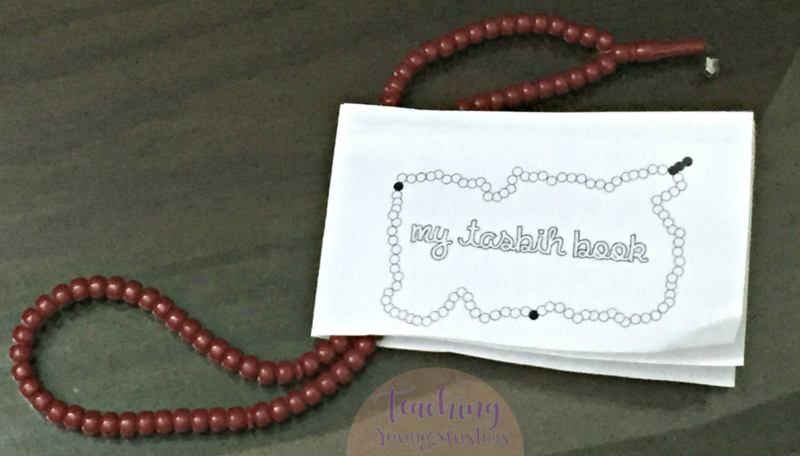 I knew she would be super-excited to trace the words that we recite in the tasbih, especially because they have the word Allah as part of them, so I created this mini Tasbih book. 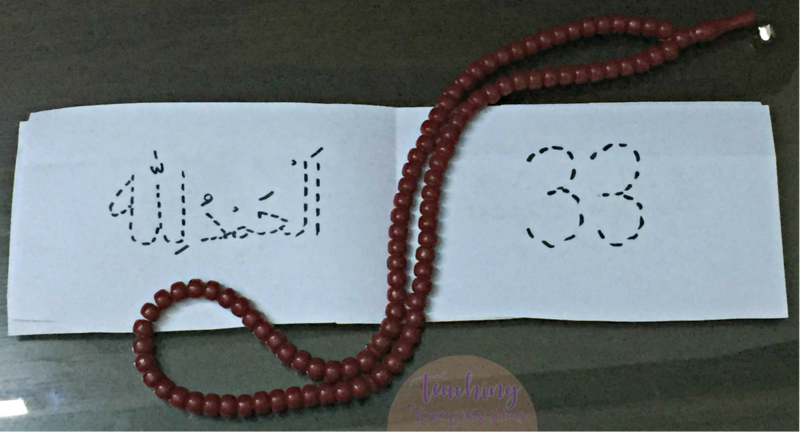 Each page has each of the phrases that we recite in tasbih in dotted lines for easy tracing. It also has the number of times that each is to be recited, also in dotted lines. If you want, you can have your child write what each phrase means as well, for a handy translation and reminder. My daughter will stick this book inside her prayer rug, and will pull it out every time she prays. It’ll make her more excited to recite the tasbih, because she loves having Dua books of her own. CLICK HERE TO DOWNLOAD! When you print it out, make sure you choose “booklet” and “double-sided.” After it’s printed, cut along the dotted line and put the two strips together to make a mini 8 page book out of a single sheet of paper. What other activities have you done with the Tasbih? I’ve always loved the idea of making my own tasbih. I’ve never actually made one for myself, though I’ve helped out in a class that made their own. I’ll definitely be doing this with my daughter once she’s older.